I’m not going to lie to you guys— I’m not much of a football fan. I’m a basketball girl living in Basketball Country, USA, but even I can appreciate the fun that is the Super Bowl. Well, more accurately, I can appreciate all the delicious food that makes an appearance on Super Bowl Sunday! We have a lot of healthier game day recipes on Wholefully (you can check them out here), but this one holds a special spot in my heart for exactly three reasons. 1) It’s delicious, really delicious. 2) It’s all make ahead—no work during the game. 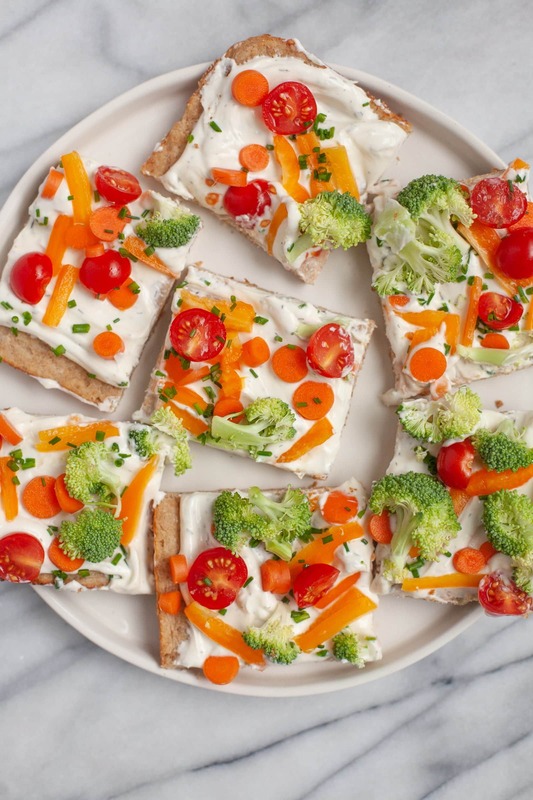 3) These veggie pizza appetizers have roots in my childhood. Growing up, my parents always threw a big rager of a 4th of July party every year for all of our friends and family (think 50+ people pitching tents all over the property and spending all weekend drinking, eating, and swimming). 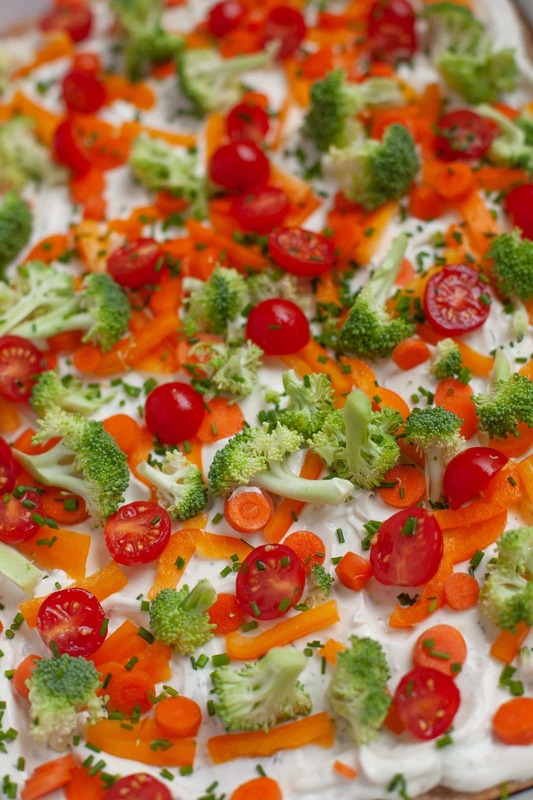 And one of our family friends always made a big batch of veggie pizza appetizers for us to snack on during the weekend. It was a crowd-pleaser. It even satisfied the veggie-hating kids at the party. The original version uses canned crescent rolls as a crust and a ton of cream cheese and sour cream for a sauce (hence why the kids would tolerate the veggies), but my version has a homebaked multi-grain crust and an herbed sauce that is healthified thanks to my beloved Greek yogurt. It’s just as yummy, but even healthier! 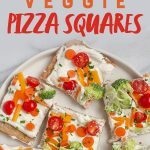 For a crowd, I like to pre-cut these cold veggie pizza appetizers into easy-to-grab squares. 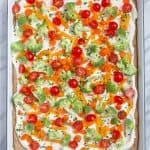 It looks so beautiful on a platter (especially when it’s up against all the brown-colored food that is typical of the Super Bowl buffet), and I think it’s a fun alternative to your standard veggie and dip tray. Trust me, no one will miss the dried out tray from the grocery store if you’ve got these flavorful squares in your offering. You can mix-and-match whatever raw veggies you like for your topping. Here, I used a combo of broccoli, peppers, carrots, and red tomatoes. This is a great mixture of textures (crunchy, smooth, watery) and flavors (sweet, tart, mild), plus it’s a whole rainbow of pretty colors! Other options: sliced green onions, chopped cauliflower, sliced olives, chopped celery, corn kernels—anything! The best part of this game day recipe? You can make all the components ahead of time and just assemble it right before kick-off. In fact, the longer the sauce sits and melds, the more flavorful it gets. So go ahead, bake up the crust, mix up the sauce, and chop your veggies the day before the game. 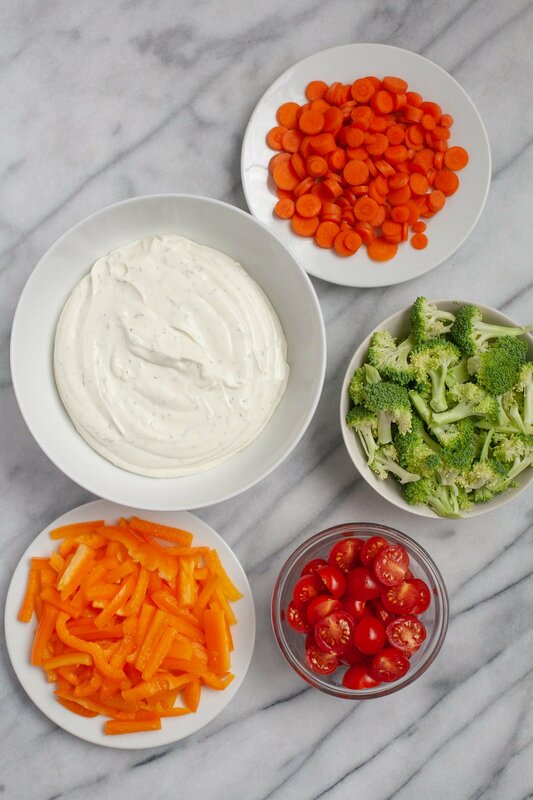 Then just assemble your veggie pizza appetizers and cut right before your guests arrive. I’m definitely not one of those game day hosts who wants to spend her time in the kitchen while everyone else is enjoying the game. I want to get a chance to enjoy the game, too! And a make-ahead recipe like this makes it easy to cheer along with your guests. Enjoy! Go Broncos! I also love cold pizza, and this looks delicious. 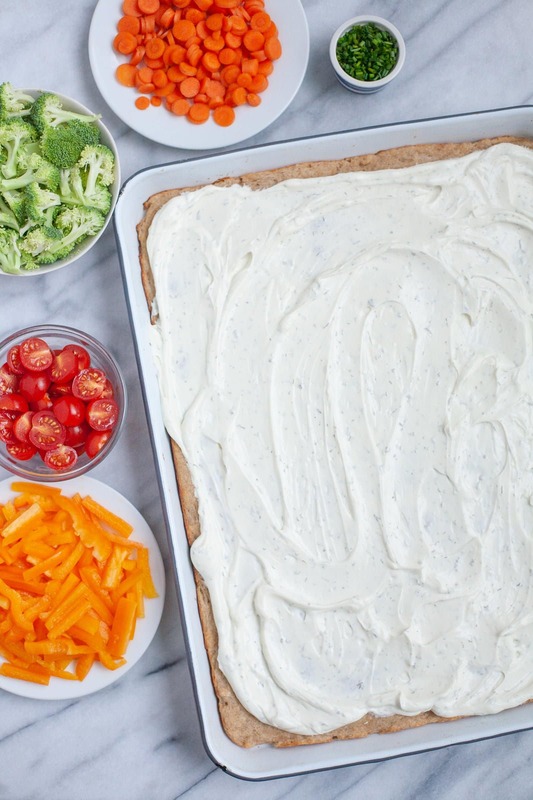 Wow–a homemade crust on veggie pizza squares?! I’m impressed and inspired. These will always remind me of family gatherings as a kid because I had an aunt who made these without fail. I loved them and haven’t had them in years. I may have to try your homemade version. Well – college football is my heart and so I’m still overjoyed at the Seminoles Win for the National Championship. As for the super bowl – I don’t really have a favorite – but its still fun to watch the game with friends. 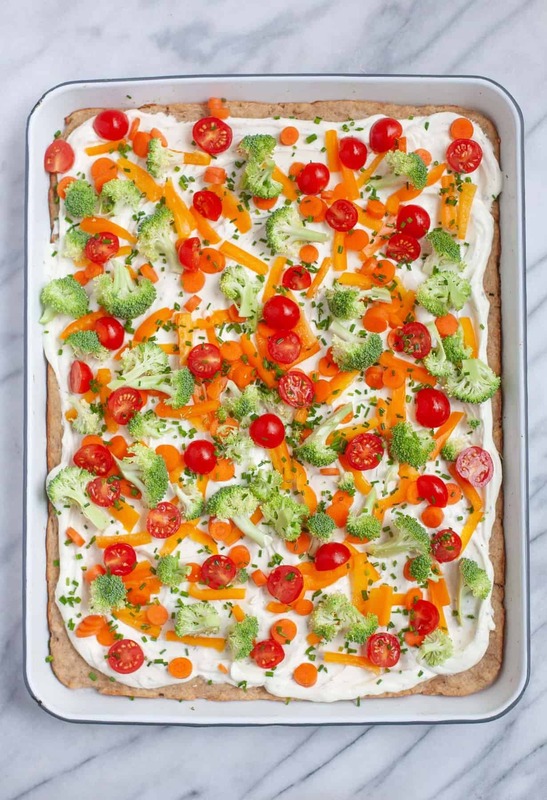 This veggie pizza looks so fun and festive! Thanks for sharing – I will definitely make this! I’m totally making this on Superbowl- it’s usually just me and my husband so this will be perfect. I am rooting for all my ads to run on time, since I sell National Advertising. By the time the game rolls around, I’m just in it to watch the ads and cross my fingers! Hi Cassie! I used your Thanksgiving menu template and hung it on the fridge for our family meal, and my husband still talks about it–so unlike him, or so I thought! He has requested something similar for the Super Bowl, preferably with helmets :) Any chance this is in the works? Either way, I think veggie pizza squares is in our future. Thank you! This looks delish and I think I’ll be making it next weekend! I’m so excited for this!! I’ve been making the original version you mentioned, but I will be making this for my friend’s Superbowl party! Thanks Lady!! PEYTON! It broke my heart when he left Indianapolis. I’m not a fan of tomatoes, but this pizza looks so good I’d be willing to give them another shot. Perfect timing! I’m hosting a party on Friday and I’m trying to come up with some relatively healthy things to serve that my friends will actually eat. This looks right up my alley. Thanks for posting! So, I did end up making this for my party last night and it was a hit! I ended up with extra sauce (and put more on the pizza than one ideal), but I’m not sure if I made my pizza a little smaller than yours? Anyway, everyone enjoyed and there were no leftovers. This dish will definitely be featured at parties in the future. I don’t think there’s many snacks better than pizza – this is so fresh and pretty! I love it! Yum! Love that you used a homemade crust! What a beautiful pizza! Those kind of bright colors draw me right in, and not just in pictures. Put an appetizer or finger food like that on a buffet table and I’ll be drawn to it first every single time. Beautiful! GREAT! I love having satisfying veggie ideas for my vegetarian friends. I hope it’s not an offence to the recipe if I still use the crescent rolls for the base — my teeny tiny kitchen lacks the space to roll out a proper dough!